In the below video, Christian Tissier Shihan (8th Dan Aikikai) demonstrates the omote and ura versions of the Aikido technique ushiro ryotedori ikkyo. The demonstrations are completed in a dynamic free flowing form whereby the uke commences the attack by proceeding to the front of the nage, grabbing the nage’s wrist and then moving to the rear (with a view to also grabbing the nage’s second wrist). This form of practice is referred to in some schools as ki no nagare. 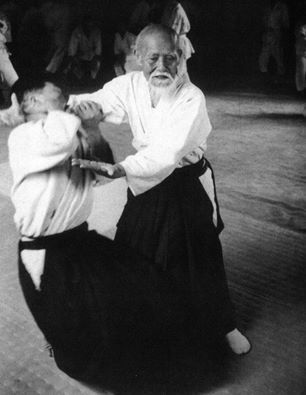 In ki aikido schools it is sometimes referred to as ryutai. In the below video Chicko Xerri Sensei (6th Dan Aki Aiki kai) explores the sword principles that underpin the higher level practice of ushiro techniques. The exploration is particularly applicable to ikkyo applications. Our dojo is part of the Aikido Kenkyukai Fodoshin Dojos (Australia). Chicko Sensei is the Shihan for our school. In the below video produced by Senshin Center Aikido Dojo, balance breaking principles applicable to ushiro attacks are explored. Kuzushi is unfortunately something that is sometimes overlooked in Aikido. The fact remains, however, that it is near impossible to throw a centred uke unless they are either cooperating or overpowered by a significantly larger nage. In the below video Chicko Xerri Sensei explores an alternate option for addressing a ushiro attack whereby the uke is not permitted to move to the rear of the nage. Chicko sensei emphasises the important aiki principle of creating a space to move before attempting an aikido application. In the below video Chicko Xerri Sensei explores a further option for addressing ushiro attacks. The option readiy sets up the circumstances for an ikkyo application. 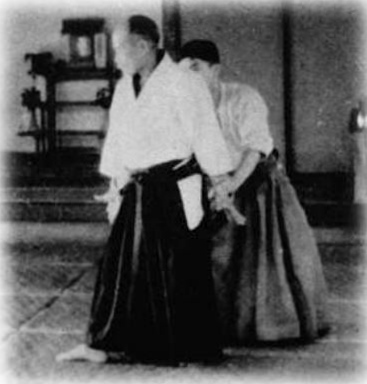 In the below video, Koretoshi Maruyama Sensei provides instruction on Ushiro tekubidori ikkyo as practised in Aikido Yuishinkai. 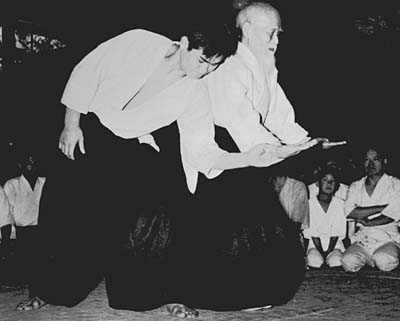 The method of application is typical of the approach taken by ki aikido schools.